Our dancers have been very busy this summer. Kaitlyn Bontrager attended Point Park and Lawrence Park's Summer Dance Intensives. Kenzie Brancato attended Point Park's Summer Intensive and the Monsters Hip Hop convention in Florida. 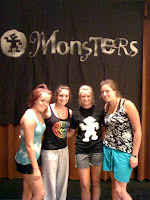 Also attending Monsters were Alyssa Beck, Samantha Moyer and Carrie Williams. Hannah Spahn attended Ballet Magnificat in Mississippi. Taylor Morian and Justice Gray attended The Pulse Tour in NYC. Emma Petasis attended the ballet intensive at Mercyhurst College and Rachel Leech attended the Pittsburgh Youth Ballet intensive. Wow! Cogratulations dancers on a great summer of dance!